If India hopes that Balochistan can be used as a lever just by dangling the unspoken threat of arming and training the Baloch rebels in the near future, it would be a mistake. That is a very twentieth century tactic which has run its course and will meet with limited success. However if India can infuse some audacity in its plans and consider a more expansive scope of any future intervention, it could lead to more desirable solutions. In the psychological sense, Pakistan may already have lost Balochistan. The sense of alienation and anger is deep and pervades most levels of the Baloch society. The question is how long can Pakistan hold on to this colony with their military firepower. It depends on how eager is India to create the next Bangladesh and how comfortable is Iran with an independent Balochistan. For the entire time that the Republic of India has existed, Pakistan has interfered in India’s internal affairs at devastating cost to millions of Indians who have borne the brunt directly, and extensively destructive to India as a whole. Pakistan backed Khalistanis visited great horror upon Punjab. Pakistan’s jihad has turned Kashmir into a pus filled sore that cannot heal. We have been brought to the brink of nuclear Armageddon. Terrorists from Pakistan repeatedly strike in India. Our economy suffers a terrific cost from Pakistan pumping fake currency notes into India. Punjab has been devastated by drugs exported from Pakistan, originally to fund terrorist insurgents. Lacs of Kashmiri Pandits were thrown into destitution and exile by Pakistan backed terrorists. Fanatical armed militias numbering in the tens of thousands swarm in Pakistan with the explicit purpose of waging Jihad against India. We have been forced into 4 wars by the Pakistani generals at great cost of soldiers lives and material. Right from 1947, Pakistan has prevented India from healthy relationships with the rest of the world by injecting itself into every dynamic, either by prostituting itself usefully to other countries and thereby hijacking their relationship with us, or by acting as their proxy and leverage against us. The west is soaking full of Pakistani sponsored propagandists who effectively lobby governments and policy makers against us. Pakistan has made so much trouble for India at the UN over the decades that we are unable to engage with that body in any way that would actually advance peace and security in the subcontinent. Afghanistan has become a stone age hell thanks to Pakistan, which is determined to keep it a den of savage Islamist barbarians under its influence rather than let India establish a stable prosperous ally. And people ask what is Balochistan to us? It’s our opportunity to pay them back. It’s our opportunity to damage Pakistan badly, perhaps even critically. 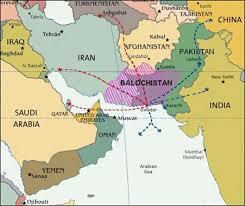 India has been foolish to not have gotten together with Iran and brought hell to Pakistan over Balochistan. But it’s not too late and MUST be done now. I am delighted that activists like Tarek Fatah are here and galvanizing India into attention, focus and purpose on that issue.